Tuscania accommodation for non smokers. You also do not like cigarette smoke or smoky smelling rooms? Then there is the offer for you nonsmokers who really do not like staying in a smoky environment. Some hotels are non-smoking throughout and do not allow to smoke in any areas, not in the rooms and also not in the common areas. Other Tuscania hotels offer a mix of smoking and non-smoking rooms and areas but for client comfort often distinguish whole smoking and non-smoking floors. Offering free WiFi and city views, b&b del Terziere di Valle is an accommodation set in Tuscania. The accommodation is 24 km from Viterbo. Agriturismo Casa Caponetti is situated in Tuscania. Complimentary WiFi is featured. Located in the heart of the Tuscania Natural Reserve, Agriturismo Poggiocolone offers a garden, bar and free Wi-Fi throughout. A campsite is available on site. With its countryside location just 5 km from Tuscania, Relais Pian Di Vico offers a landscaped garden and a free summer pool. Rooms mix original rustic details with a flat-screen TV and air conditioning. Hotel Tuscania Panoramico provides elegant accommodation with enchanting views over Tuscania’s medieval town centre in a fascinating area in the Lazio countryside, just 15 minutes from Lake Bolsena. 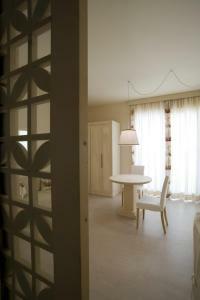 All of the hotel’s well-equipped rooms are spacious, quiet and comfortable, being furnished in a typical local style. Casa Desdy offers accommodation with a terrace and free WiFi. Fitted with a patio, the units offer air conditioning and feature a flat-screen TV and a private bathroom with free toiletries. Centrally located in Tuscania, just 200 metres from Tuscania Nature Reserve, OM Palace has a terrace and a shared lounge. It offers free Wi-Fi and accommodation with design furnishings and a glass elevator. Offering free bikes, La Stalla is located in Tuscania. It offers a garden, free WiFi in public areas and self-catering accommodation. Set in Tuscania, Apartment Consalvi provides accommodation with free WiFi and seating area. The accommodation comes with a flat-screen TV and a private bathroom with bidet, shower and free toiletries, while the kitchenette has a toaster, a fridge and a stovetop. Featuring garden views, Agriturismo Arte et Agricoltura in Tuscania features accommodation and free bikes. Complimentary WiFi is offered. Boasting free bikes, Casa Vacanze Nonna Giò provides accommodation in Tuscania with free WiFi and garden views. Guests benefit from a balcony and a terrace. At Locanda di Mirandolina you will enjoy elegant rooms with free Wi-Fi and a varied breakfast served in restaurant room and also including homemade pastry and jams. It is possible to request in advance for a gluten-free or savory breakfast. Located in the peaceful countryside of Tuscania, Locanda Rossovino has an à-la-carte restaurant, a free outdoor pool, and a hot tub. It offers free Wi-Fi and accommodation with garden views. Featuring a seasonal outdoor swimming pool, a garden as well as a terrace, Bicoca - Nuova Fattoria is set in Viterbo, within 15 km of Terme dei Papi and 19 km of Natural springs of Bagnaccio. Complimentary WiFi is offered. Il Borgo di Arturo is set in a 500-m² furnished garden a 10-minute walk outside Canino. It offers modern rooms and a restaurant, just 15 minutes’ drive from the Etruscan spa town of Vulci. This B&B is themed in a unique Etruscan style. Both Lake Bolsena and the sea in Montalto di Castro are within a 20-minute drive of the property. Offering it private outdoor swimming pool, Agriturismo Il Marrugio set in the Viterbo countryside. Cosy rooms have air-conditioning, heated floors, and free internet. With garden views, Cerrosughero is located in Canino and has a restaurant and room service. Free WiFi is offered. Located in Marta, La Cannara offers free WiFi, and guests can enjoy a seasonal outdoor swimming pool, a spa and wellness centre and a garden. Some units have a terrace and/or patio. Located in Marta, Borgo Sacramento 110S provides a private pool. Guests staying at this holiday home have access to free WiFi.